The upcoming trends would be leaving an everlasting impact in the web world. It concentrates on gaining a competitive edge over the competitors and win the trust of more clients. The PHP Development Services and WordPress Development Services are making the websites a lot better. Many people prefer purchasing stuff online. Due to this, the online sales market has increased by 20% in the last year and is steadily growing. The blockchain is the most fruitful method of shared data storage. It provides an elevated level of security for all the information stored in the computers globally. The significant benefit is the absence of intermediaries between transactions. A single-page website is a scrollable page that consists of entire information regarding the site without opening any other web page. It provides easy access to the website, saving the time of moving to complex navigations and menus. Chatbots provide quick information from the client without any human intervention. The websites developed with appropriate online assistance. It allows users to access data, order food, book tickets, etc. with just one click. It provides a flexible system where numerous online stores cooperate with each other. For example, if an item purchased from eBay, it can be collected from a small store nearby. Multiple e-commerce brands will connect to single e-commerce network soon. Motion UI keeps the website simple. Most of the users are fed up with the flashing advertisements. It will have moderate design and get maximum appreciation. It will gain an edge over the websites with static UI. The visitors were given an explanation of the product and service in a smoother, more comfortable and a better way. It is stated that video content increases sales by almost 64-84%. Live videos are highly trending nowadays and drive 300% more engagement than standard videos. Social selling is like a blessing for all the online businesses. It is a procedure where a business connects to social apps thereby generating higher revenue. The benefits will be an increase in sales and target potential customers easily. They are websites quite similar to mobile apps. They load instantly and work offline leading to better user experiences. Probably, following web apps will turn out to be a significant competitor of native mobile apps. It is a simple, quick and communicative trend. It helps the marketers to reach out to their audiences through their mobile devices. For example, Snapchat has chosen an AR feature that allows the users to add their Bitmoji. It is a unique trend that sends the website visitor a push notification at arrival. Once a push notification is submitted, the visitor will further be notified of any changes on the website even if he is not active thereby reaching a lot of visitors with minimal efforts. All these trends are going to turn out to be a reality soon! 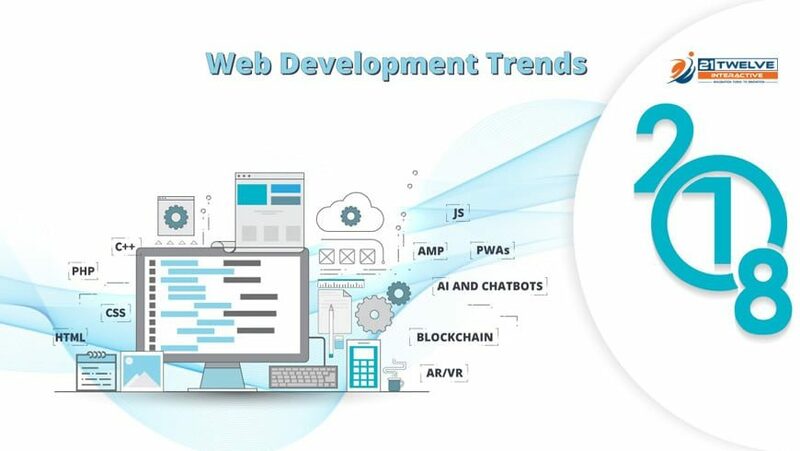 So gear up to cope up with the upcoming trends in 2018 and witness the evolving web application development phase.